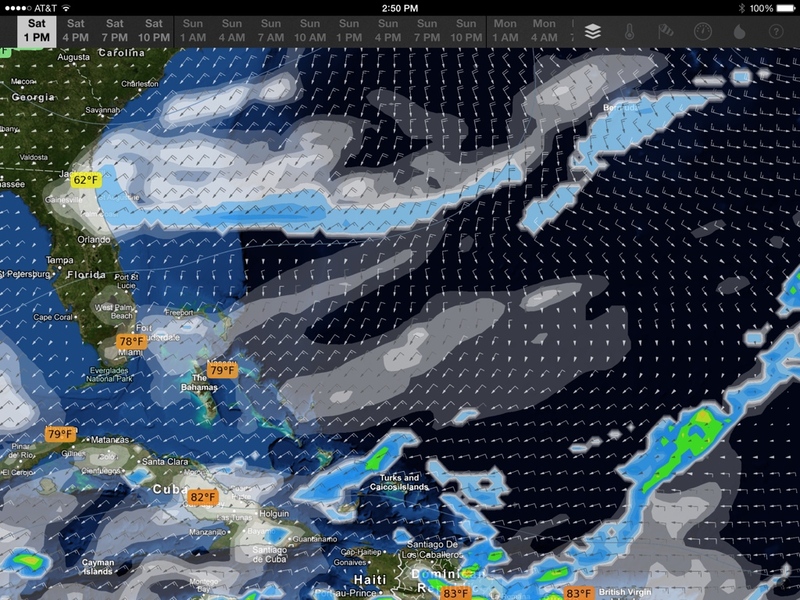 PredictWind is turning out to be a favorite app for passage planning. 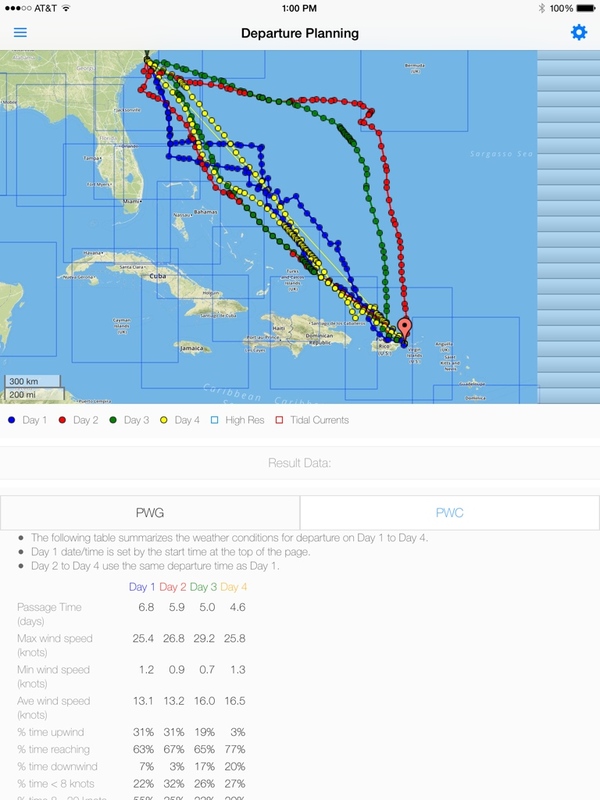 It combines many pieces of weather data and presents us with several sail-plan options from our starting place to our end point, taking into account if we want the fastest trip or the most comfortable (there are many settings you can play with, each producing different outcomes). To help us choose the best day to leave, PW also produces detailed sail-plans across four consecutive departure days. 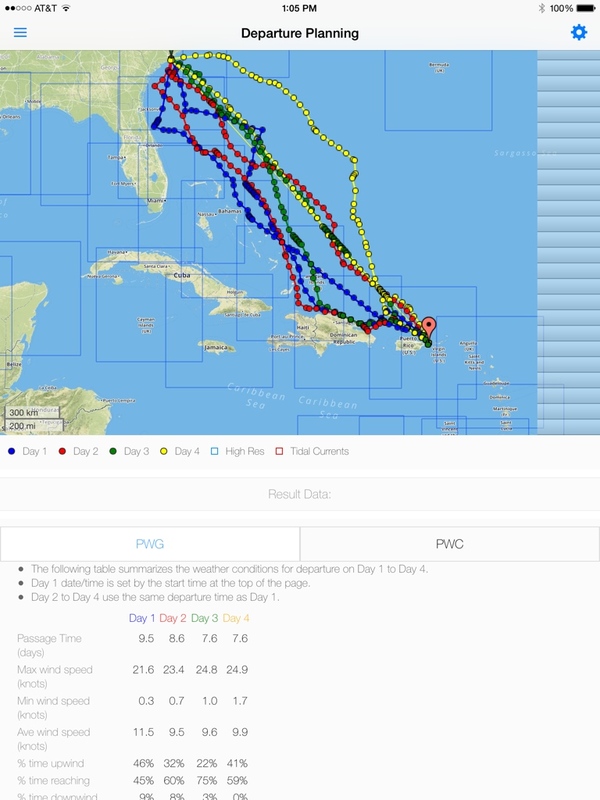 The four days are color-coded paths in yellow, red, green and blue on the map. We can look at the wave heights, direction, winds, and currents, and imagine what each alternative sail-plan would feel like…before we choose when to leave. As you compare what your passage would be like on any of the four different days, you can see the amount of time you’d be heading into the wind versus how much you’d be reaching or sailing downwind, the percentage of time you’d have winds of various strengths, and how often you’d be sailing with various predicted wave heights, etc. This data will help us to choose an optimal departure time, course, and know what to expect on that course at any given time. 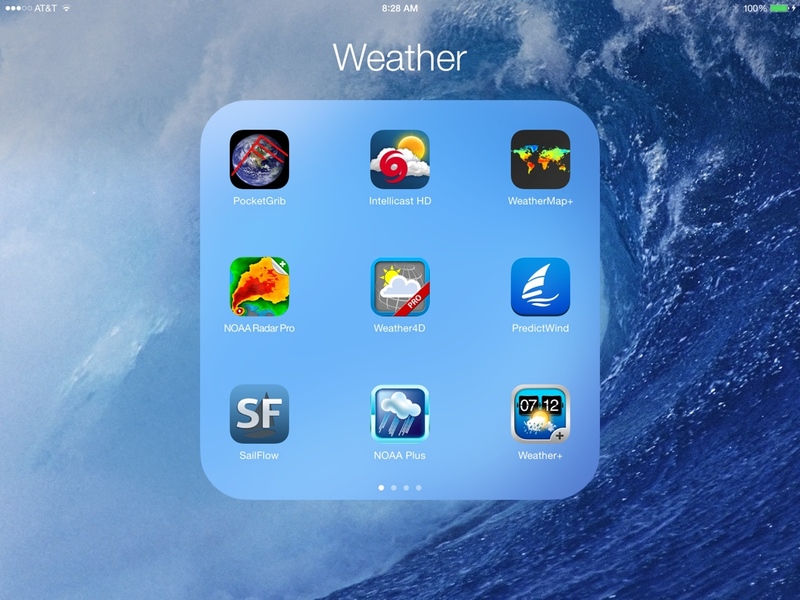 PW has a free version that is already a great app, but the promise of being able to do weather and departure planning at 1km resolution GRIB files, and a review on Practical-Sailor, whet my appetite for more. Other features I like in the upgrades are the route planning with our boat’s polars, the options of choosing speed or comfort, the ability to look at departure planning four days out, and the two weather models you can choose for comparison. Still, the upgrades are pricey, so I waited until I was within 30 days of the end of our passage from the US to the Caribbean, and then I bought the one-month Professional Plan subscription for $49. After the end of this month, I may opt for the full year pro package, which is 12 months for the price of 10. Here is PredictWind’s pricing page which shows exactly what you get at each level. 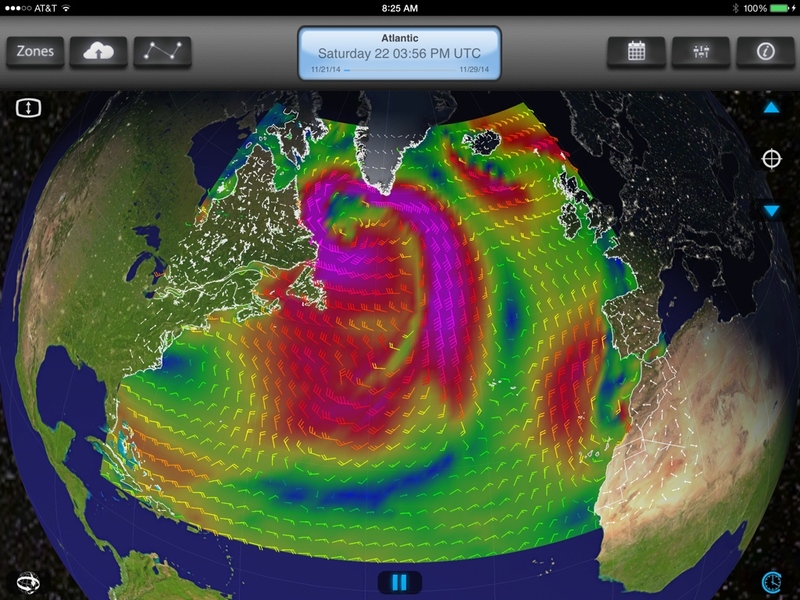 One of the greatest advantages of PW for me is what I call the visually-useful, data-rich integration factor. 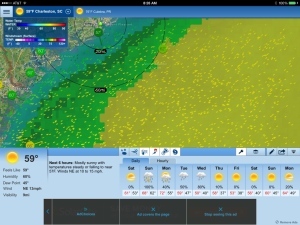 We use Chris Parker‘s excellent forecasts that we subscribe to, and we download GRIB files daily via our SSB, and I download GRIBs from PassageWeather.com, and use a host of other outlooks on weather, but there’s no single, visual source I’ve found that integrates so much real-time data, and then presents it visually and with the alternatives shown next to each other as PredictWind does. That’s why it’s becoming our number one go-to resource for passage planning. PW can also turn your iPad/iPhone into a tracking GPS device, but that drains the battery faster. We may try it on our upcoming passage as a second tracker since we have the DeLorme Explorer. Check back next month and I’ll probably have a post about that. Below are some screenshots of our planned course from Charleston to the Spanish Virgin Islands that illustrate how PredictWind works. One parameter I was very interested to see: comfort versus speed, so I’ve shown the different course recommendations for the most comfortable journey, and the fastest. The most uncomfortable conditions are going upwind in strong wind conditions. We may decide to tolerate bigger seas and winds, but just to see what PW gave us, I adjusted the settings to minimize the time going upwind (less than 45 degrees) in more than 2 meter seas or 25 knots of wind and that generated the plush-comfort setting. PW’s comfort option then chooses routes that avoid (where possible) these conditions, which helps us plan a course for the safest and most comfortable journey. 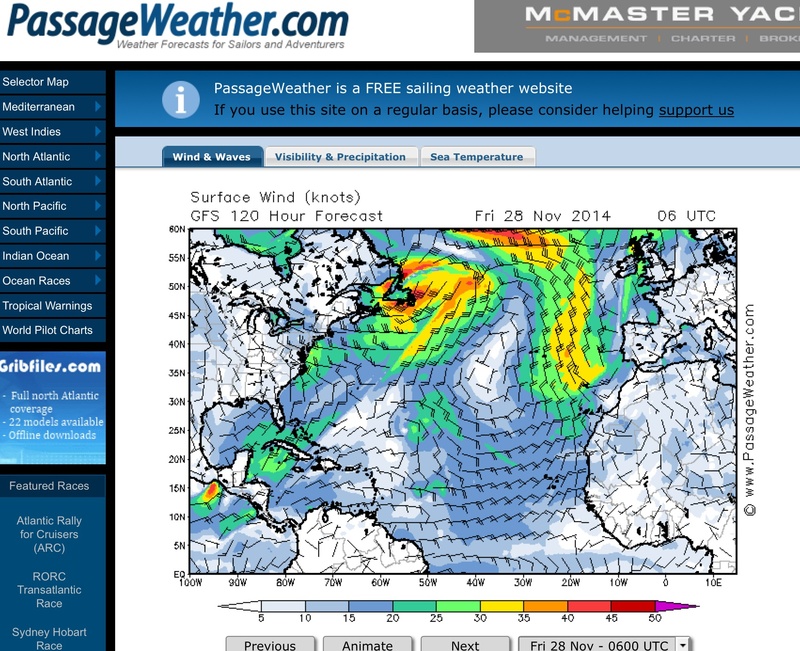 How Best to Cross the Gulf Stream?